The Puccini Festival in Torre del Lago is the only one in the world dedicated to the composer Giacomo Puccini. It takes place every summer during the months of July and August, in the places that inspired Puccini’s immortal music. The festival saw it first light in 1930 and over the years has become an increasingly prestigious event: each year it attracts thousands of people from all over the world. 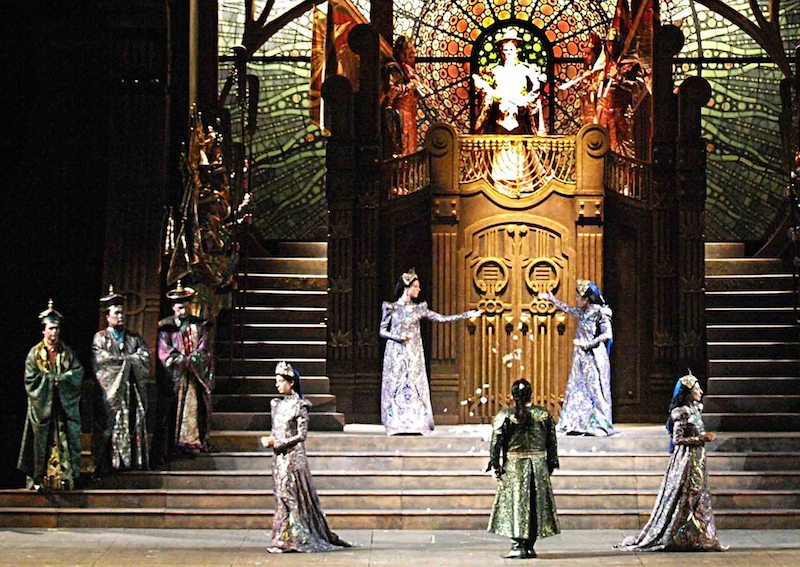 Here, you can appreciate the most famous Puccini’s operas such as Tosca, Turandot, La Bohème and Madama Butterfly. The great open air theatre opens onto the pictoresque Massaciuccoli lake close to Villa Puccini, the house builded by the composer in 1900. Here you can find his mortal remains and you can admire his relics. Tau Touring car hire with driver company in Lucca offers to you a collettive “shuttle” service to join the Puccini Festival, by leaving from Lucca outside Porta S. Pietro at 7.30 PM and coming back at the end of the opera, at a total price of € 25,00 per person. It is possible to be picked up directly to your hotel, and to be dropped off there on the way back, if your accomodation is in the city centre or if it is very close to it. In this case, there will be a five euros surcharge and the total price will be € 30,00. If you decide to leave with us, you don’t have to be worried about finding a parking lot or having enough time to collect your tickets once you arrive there. However, we offer not only a collective “shuttle” service: you can organize with us your private transfer, you can choose at what time and from where you want to leave. One of our drivers will be totally at your disposal and he will be waiting for you until the end of the opera. If you ask for it, we’ll book for you a dinner in a very typical restaurant on the banks of the Massaciuccoli lake. Giacomo Puccini was an Italian composer whose operas are among the important operas played as standards. He has been called the greatest composer of Italian opera after Verdi. He was born in Lucca on 22nd December 1858, the fifth of nine children and the last descendant of a family of musicians. After his father death in 1864, he spent his youth between his family house in Lucca and their summer house in Celle. At the age of nine, he entered the seminary and later became a choirboy and organ player in the Cathedral of Lucca. But young Puccini preferred opera to church services. At the end of 1880, after obtaining his diploma from the Pacini School of Music in Lucca, he went to study at the Conservatory in Milan. His first works were born in Lucca, but with his third opera, Manon Lescaut, national success and fame finally arrived. Puccini was 35. He settled in Torre del Lago with his wife Elvira and his son Antonio. Here on the banks of Lake Massaciuccoli, he wrote most of his operas: La Bohème, Tosca, Madama Butterfly. His last opera, Turandot, has been a very difficult work, and he thought a lot of times to leave without finishing it. He died in 1924. The incomplete Turandot has been played for the first time in 1926, and since then it is one most famous operas all over the world.